I’ve reduced the springboard of my jailbroken iTouch to a minimalistic Dock consisting only of the iPhone Mail.app to read and write mails properly (as opposed to having to use webmail on an unbroken iTouch), an RSS-reader to watch other math-blogs and the arXiv (via Install.app under Productivity/MobileRSS), the Safari webbrowser and a Finder (via Install.app under Productivity/MobileFinder) to launch all other programs, when needed. 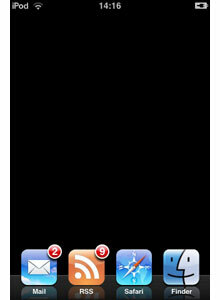 To achieve this effect, install (as in the jailbreak-post) all these apps as well as Customize.app (under Utilities). This allows you to change the icon order on your springboard and dock as well as to toggle the visibility of these icons. Just make sure to have either Finder or Customize visible at all times or it will be difficult to get at the invisible apps (an alternative is to install something called Sunburst). While the iTouch is great to read, it is harder to type a lot of text into it. Whence the idea of running a Wiki on it (now that we have PHP enabled Apache) and use another computer to create the wiki-pages. For example think of a small database of weblinks with descriptions. Rather than bookmark them one by one in Safari, make wiki-pages for them and use the Search function to get the desired link. That is, you’ve used up almost all disk space of the partition on which the /Library/WebServer/Documents folder resides. So, we first need to move it to the other partition under /private/var, so why not create a Documents-folder under the root-homefolder and link to it? Check it with http://localhost/ and you should still see your default Apache-page (though it now comes from another location). 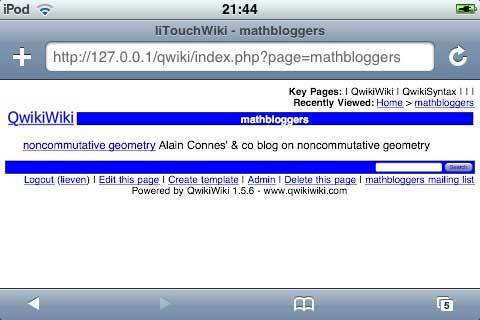 The next step is to find a PHP-Wiki hat works on the iTouch and doesn’t require a Mysql-database. I’ve tried at least ten without success and then I turned to the Wiki Engines Page and found QWikiWiki which does seem to work. So download it, rename the folder to something you like such as ‘qwiki’ and upload via SFTP to the /var/root/Documents folder of your iTouch and chmod it recursively to 777. If you ever need to change some of the PHP-variables, copy the php.ini from you mac over to the /opt/iphone/bin folder of the iTouch. and follow the online instructions. A few moments later you can type in your first wiki-page!